Tina Engels interviews painter Anne Harris about her work. 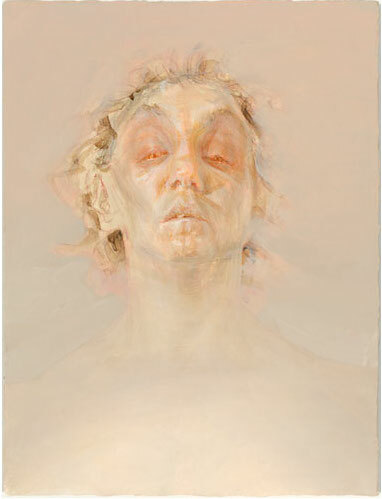 Harris comments: "I think painting is fundamentally perceptual. It’s experienced in a sensory way. I don’t mean just seeing. Touch, movement, memory, imagination and emotion—all can be understood as perception, and all are involved when making paintings and looking at paintings. Painting from life, which I do, is another aspect of this. We each perceive the world differently: information passes through our senses to our minds, through our bodies to our hands, which then touch a surface to make marks that are specifically ours. That said, when I’m painting, I’m always looking at something. It may be that I’m just staring down the painting trying to figure out what it is, what belongs there, what’s next; or I may be looking at myself, or at a model or at other drawings or paintings in my studio."